NOTE: This post is not entry-level. This will be a deep dive into complex Aggressor scripting, and undocumented functionality. Fair warning — even I don’t understand visualizations fully, and there’s a lot more to explore. This is just scratching the surface. If you saw my blog post a couple weeks ago, you know that I like writing Aggressor scripts for Cobalt Strike. 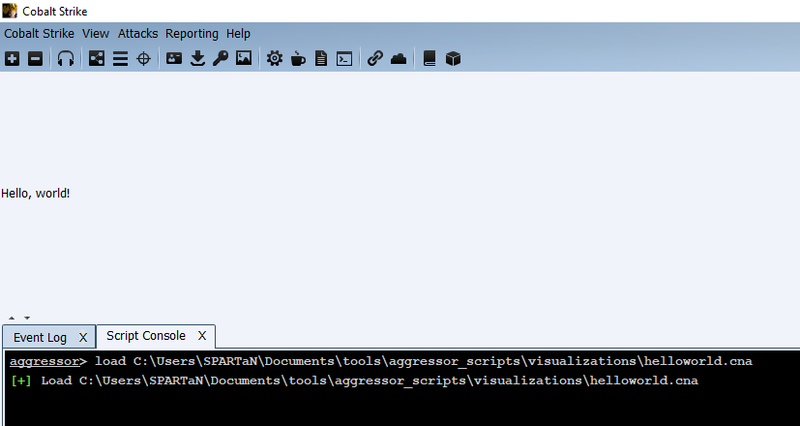 Aggressor allows you to add functionality to the framework, and make it even more useful for your purposes. This can be done in many different ways, but one thing that has caught my interest recently is the possibility offered by Cobalt Strike visualizations. Visualizations are the different views that Cobalt Strike offers to an operator, found in the View menu. The default visualizations are what you’re used to seeing in the top pane of Cobalt Strike: Sessions view, Targets view, and the Pivot Graph. Basically, they’re there to give you information about the engagement, and the current state of Cobalt Strike. But what if we could display more information to operators? What information is kept within the framework that isn’t as easy to see? More importantly, how can we display that to operators to allow them to use that information? Register a visualization with Cobalt Strike. Not much to go on. I wanted to find out more. What else could I do with addVisualization? Could I create anything useful? There was one problem… There weren’t any other examples of visualizations in Cobalt Strike. None. I looked exhaustively. There were Aggressor scripts that dealt with GUI elements — notably from @bluescreenofjeff and @harmj0y, both of which were extremely helpful for certain parts — but there were no scripts that I could find that actually created visualizations. Without other code to reference, I was in uncharted territory. Rather than give up, I fired up Cobalt Strike and started tinkering. The first step was to create a very simple visualization. I just wanted to make sure that I could add a visualization to the framework and display it. From there, I could build on that to make a visualization that actually displays useful data. Before we go through this simple script, we need to talk a little bit about Java inside of Aggressor. If you haven’t dealt with Java in Aggressor before, Aggressor scripts can import any Java packages or libraries you want, and you can access them from within Aggressor with a slightly different syntax compared to what you might do in Java. This syntax will let us convert Java to Aggressor, and thus create more advanced visualizations. Back to our simple visualization. While creating my first test visualization was pretty easy, the rest wasn’t so easy. Working without a good reference, I turned to the source code for Armitage, Raphael Mudge’s precursor to Cobalt Strike. Many parts of Cobalt Strike are based on Armitage, and luckily still utilize many similar components. By looking through the various Cortana scripts (the precursor to Aggressor), I managed to cobble together a basic visualization that allowed me to display a table of Beacons alongside a simple console display, vis.cna. Vis.cna in all its glory. As you can see, it was fairly minimal, but it provided a good way to test out various things within Cobalt Strike visualizations. This visualization pulls information from the Cobalt Strike data model to populate the table of Beacons on the left, and displays web log hits and new Beacon events in the console on the right. There was one major issue with this visualization, but first let’s go through how it’s constructed. I started my work on a custom visualization by attempting to build a simple table, and to pull Beacon data into that table. To create a table, it first requires a GenericTableModel, which is what will populate our table with data. GenericTableModel is provided by the table package, built in to Cobalt Strike. To create a GenericTableModel, you provide an array of column names, a column to use as the lead column, and an expected size for the table. The next question is: How do we pass data into our GenericTableModel? In vis.cna the function that does that is updateTable(). This function is fairly straightforward. First, we clear the model. Next, we have to iterate through the Beacons that Cobalt Strike has information about, and create a hash with the appropriate user, host, and ID for each one.Then, we use the addEntry method of GenericTableModel to add the entry to the model. We’re not quite done yet, because we have to tell the ATable we’re populating with this GenericTableModel that the model has changed. That’s where fireListeners comes in. Now that we’ve created our GenericTableModel to populate it with data, let’s create our ATable. First, we create a new ATable, with the GenericTableModel as an argument. The last thing we need to do before adding our new visualization is call our updateHosts function to populate data into the GenericTableModel. Then, we can finally add our visualization to Cobalt Strike with addVisualization(“Custom”, $content). Note that this doesn’t do anything with the visualization, it just registers it with the framework. Visualizations are referenced by their title in Cobalt Strike, so we choose the title that we used in addVisualization as the argument in showVisualization. At the bottom of vis.cna, I have a short snippet to add the visualization to the View menu in the Cobalt Strike interface, which will allow us to quickly access the new visualization. Hopefully this post has been useful if you’re interested in Cobalt Strike visualizations! This is just scratching the surface of what is possible, and I’m working on exploring these possibilities, but I wanted to share what I’ve learned so far in the hopes that others will see this post and decide to experiment as well. At the most basic, visualizations are just JComponent objects, and they can allow you to customize how information is displayed to operators in Cobalt Strike. I haven’t seen other public examples of Cobalt Strike visualizations, but check out my logvis.cna script for another example, and please let me know if you make anything with visualizations! I hack things and other stuff.